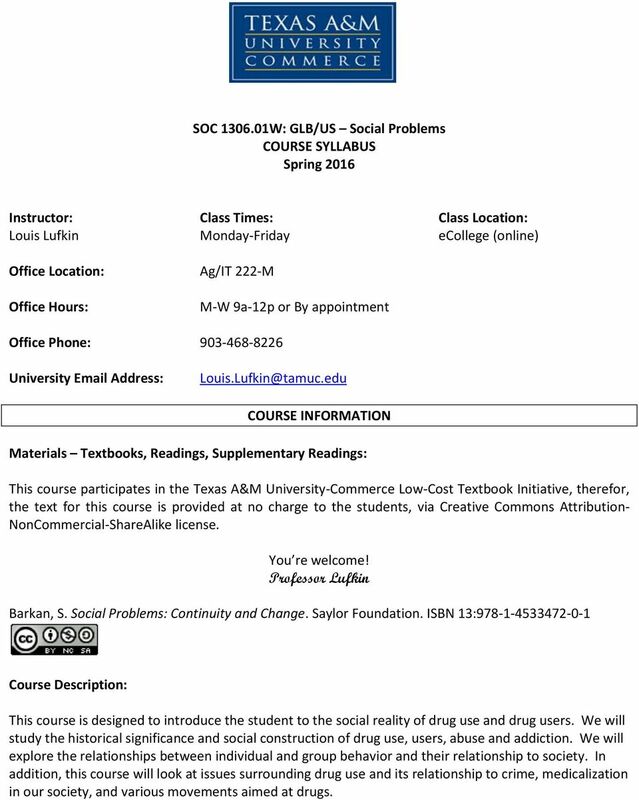 Download "SOC 1306.01W: GLB/US Social Problems COURSE SYLLABUS Spring 2016"
1 SOC W: GLB/US Social Problems COURSE SYLLABUS Spring 2016 Instructor: Class Times: Class Location: Louis Lufkin Monday-Friday ecollege (online) Office Location: Ag/IT 222-M Office Hours: M-W 9a-12p or By appointment Office Phone: University Address: COURSE INFORMATION Materials Textbooks, Readings, Supplementary Readings: This course participates in the Texas A&M University-Commerce Low-Cost Textbook Initiative, therefor, the text for this course is provided at no charge to the students, via Creative Commons Attribution- NonCommercial-ShareAlike license. You re welcome! Professor Lufkin Barkan, S. Social Problems: Continuity and Change. Saylor Foundation. ISBN 13: Course Description: This course is designed to introduce the student to the social reality of drug use and drug users. We will study the historical significance and social construction of drug use, users, abuse and addiction. We will explore the relationships between individual and group behavior and their relationship to society. In addition, this course will look at issues surrounding drug use and its relationship to crime, medicalization in our society, and various movements aimed at drugs. 2 Student Learning Outcomes: This course is intended to enable you to: 1. Demonstrate creative thinking by linking content and insights from multiple disciplines. 2. Communicate, in written, oral, or visual means and in a manner appropriate to audience and occasion, with an evident message and organizational structure. 3. Interpret, test, and demonstrate principles revealed in empirical data. 4. Demonstrate awareness of societal and/or civic issues. 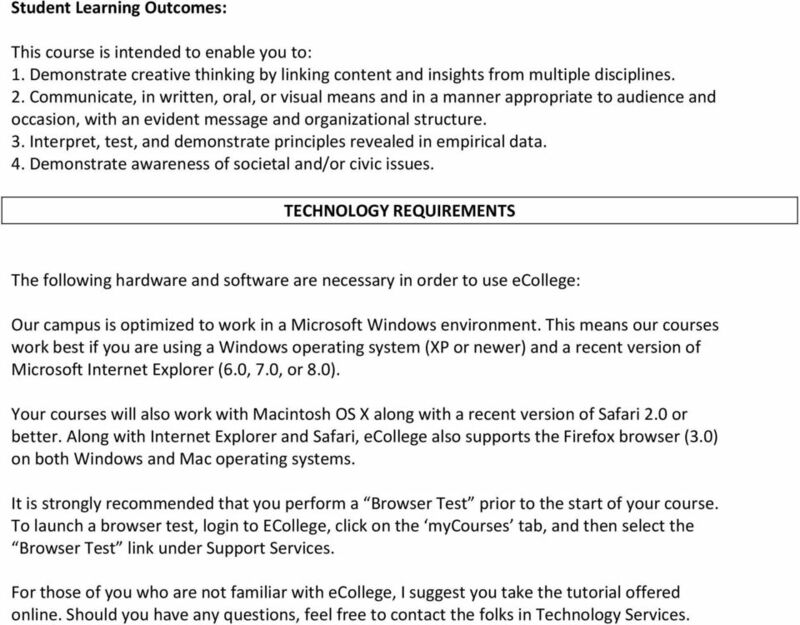 TECHNOLOGY REQUIREMENTS The following hardware and software are necessary in order to use ecollege: Our campus is optimized to work in a Microsoft Windows environment. This means our courses work best if you are using a Windows operating system (XP or newer) and a recent version of Microsoft Internet Explorer (6.0, 7.0, or 8.0). Your courses will also work with Macintosh OS X along with a recent version of Safari 2.0 or better. Along with Internet Explorer and Safari, ecollege also supports the Firefox browser (3.0) on both Windows and Mac operating systems. It is strongly recommended that you perform a Browser Test prior to the start of your course. To launch a browser test, login to ECollege, click on the mycourses tab, and then select the Browser Test link under Support Services. For those of you who are not familiar with ecollege, I suggest you take the tutorial offered online. Should you have any questions, feel free to contact the folks in Technology Services. 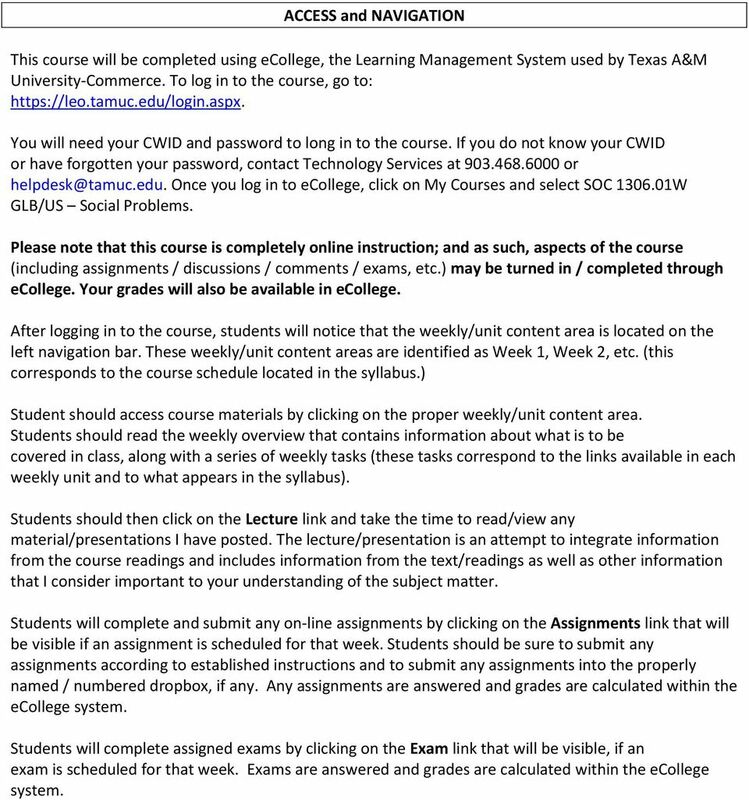 3 ACCESS and NAVIGATION This course will be completed using ecollege, the Learning Management System used by Texas A&M University-Commerce. To log in to the course, go to: You will need your CWID and password to long in to the course. If you do not know your CWID or have forgotten your password, contact Technology Services at or Once you log in to ecollege, click on My Courses and select SOC W GLB/US Social Problems. Please note that this course is completely online instruction; and as such, aspects of the course (including assignments / discussions / comments / exams, etc.) may be turned in / completed through ecollege. Your grades will also be available in ecollege. After logging in to the course, students will notice that the weekly/unit content area is located on the left navigation bar. These weekly/unit content areas are identified as Week 1, Week 2, etc. (this corresponds to the course schedule located in the syllabus.) Student should access course materials by clicking on the proper weekly/unit content area. Students should read the weekly overview that contains information about what is to be covered in class, along with a series of weekly tasks (these tasks correspond to the links available in each weekly unit and to what appears in the syllabus). Students should then click on the Lecture link and take the time to read/view any material/presentations I have posted. The lecture/presentation is an attempt to integrate information from the course readings and includes information from the text/readings as well as other information that I consider important to your understanding of the subject matter. Students will complete and submit any on-line assignments by clicking on the Assignments link that will be visible if an assignment is scheduled for that week. Students should be sure to submit any assignments according to established instructions and to submit any assignments into the properly named / numbered dropbox, if any. Any assignments are answered and grades are calculated within the ecollege system. Students will complete assigned exams by clicking on the Exam link that will be visible, if an exam is scheduled for that week. Exams are answered and grades are calculated within the ecollege system. 4 Interaction with Instructor Statement: COMMUNICATION and SUPPORT My primary form of communication with the class will be through announcements on ecollege, and e- mail. Any changes to the syllabus or other important information critical to the class will be disseminated to students via Announcements and your official University address available to me through MyLeo. It will be your responsibility to check your University regularly. Students who wish to discuss an issue with me personally should do so through or through my (in person) office hours. Students who me can expect a reply (at MY earliest convenience) within 24 hours Monday- Thursday. Students who me during holidays or over the weekend, i.e. Friday-Sunday, can expect a reply (at MY earliest convenience) on the next regularly scheduled business day. This will be strictly adhered to!!! 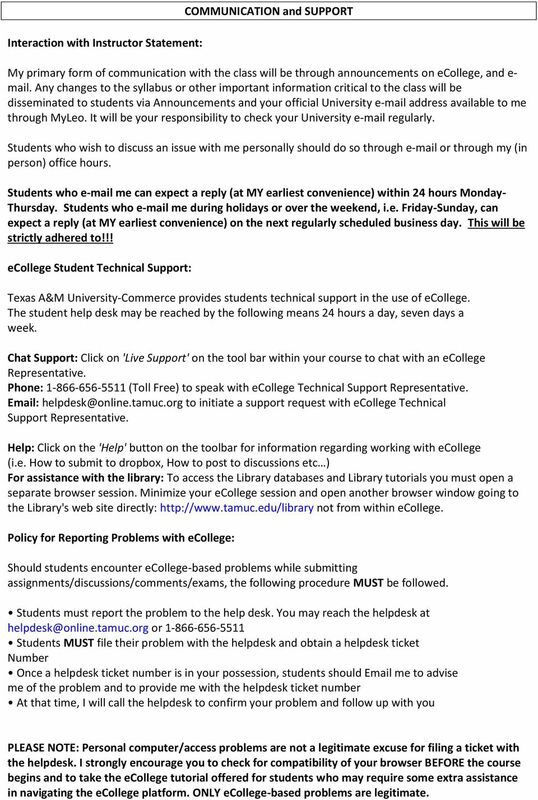 ecollege Student Technical Support: Texas A&M University-Commerce provides students technical support in the use of ecollege. The student help desk may be reached by the following means 24 hours a day, seven days a week. Chat Support: Click on 'Live Support' on the tool bar within your course to chat with an ecollege Representative. Phone: (Toll Free) to speak with ecollege Technical Support Representative. to initiate a support request with ecollege Technical Support Representative. Help: Click on the 'Help' button on the toolbar for information regarding working with ecollege (i.e. How to submit to dropbox, How to post to discussions etc ) For assistance with the library: To access the Library databases and Library tutorials you must open a separate browser session. Minimize your ecollege session and open another browser window going to the Library's web site directly: not from within ecollege. Policy for Reporting Problems with ecollege: Should students encounter ecollege-based problems while submitting assignments/discussions/comments/exams, the following procedure MUST be followed. Students must report the problem to the help desk. You may reach the helpdesk at or Students MUST file their problem with the helpdesk and obtain a helpdesk ticket Number Once a helpdesk ticket number is in your possession, students should me to advise me of the problem and to provide me with the helpdesk ticket number At that time, I will call the helpdesk to confirm your problem and follow up with you PLEASE NOTE: Personal computer/access problems are not a legitimate excuse for filing a ticket with the helpdesk. I strongly encourage you to check for compatibility of your browser BEFORE the course begins and to take the ecollege tutorial offered for students who may require some extra assistance in navigating the ecollege platform. ONLY ecollege-based problems are legitimate. 5 Instructional / Methods / Activities Assessments COURSE REQUIREMENTS This course consists of a series of activities and assessments to assist you in achieving the outcomes for the course. Each week you will work on various combinations of assignments, activities, discussions, and readings. Due to the technical nature of the materials being presented, it is highly recommended that the student take notes over the readings, online lectures, discussions, videos and assignment activities. Accessing all weekly content items is required!!! Grading A total of 350 points are attainable in the course. The breakdown of points is as follows: Discussion Posts 20 pts =100 points Midterm Exam 100 pts =100 points Final Exam 150 pts =150 points =350 points TOTAL The final grades in this course will be calculated according to the following scale: A B C D F points points points points 209 points and below The student s grade in this course will be a direct result of the student s personal dedication to the course requirements. There will be no curving of grades. Special Note: When checking grades on ecollege, the system only gives a percentage of the total assignments the student has attempted. 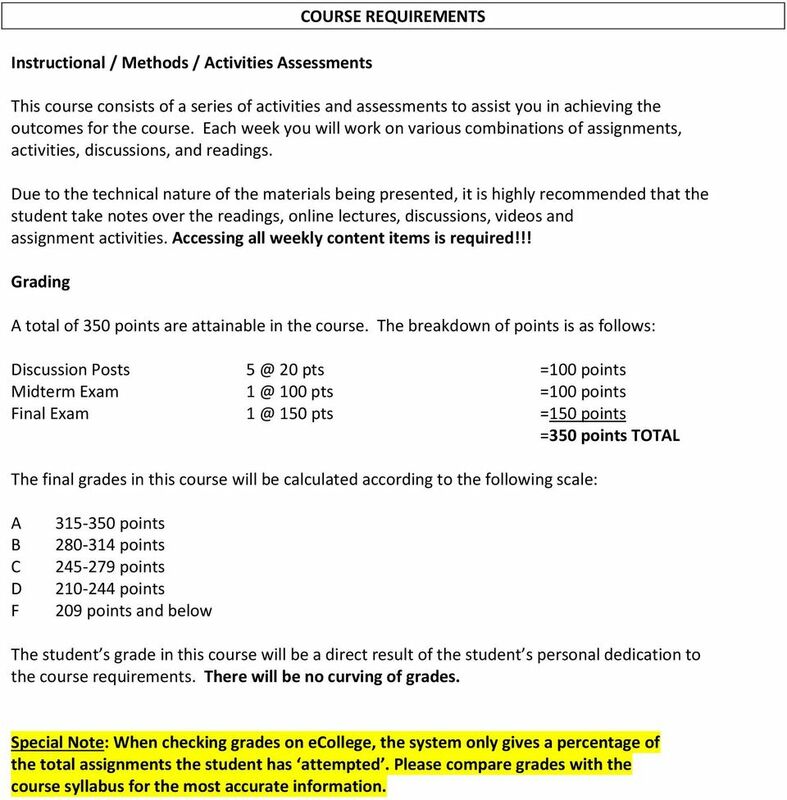 Please compare grades with the course syllabus for the most accurate information. 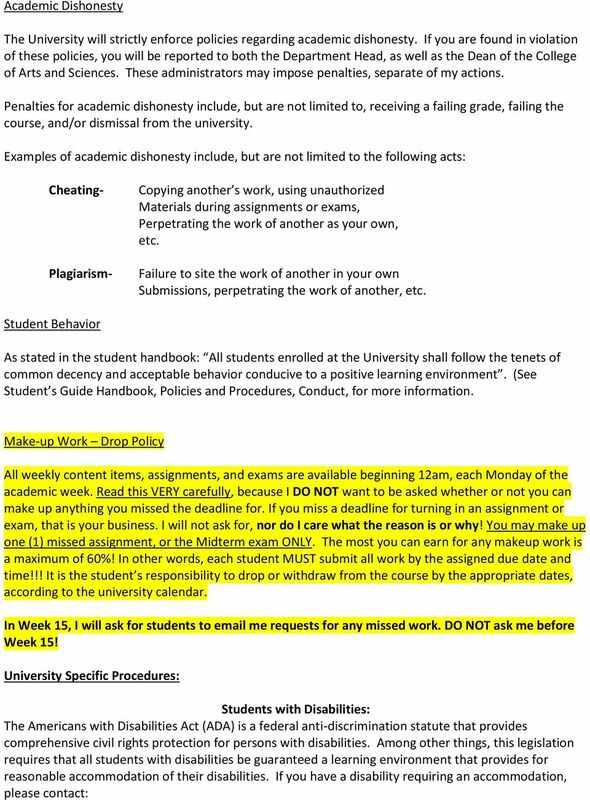 6 Course Specific Procedures: Attendance Policy COURSE AND UNIVERSITY PROCEDURES/POLICIES Each week s content items will not be accessible until Monday, 12am, of each week, according to the University schedule. It is each student s responsibility to access the weekly course content items and complete any assignments, activities, and exams as outlined in this syllabus. Discussion Posts There will be five (5) Discussions regarding one(1) social problem each; worth 20 points per Discussion. 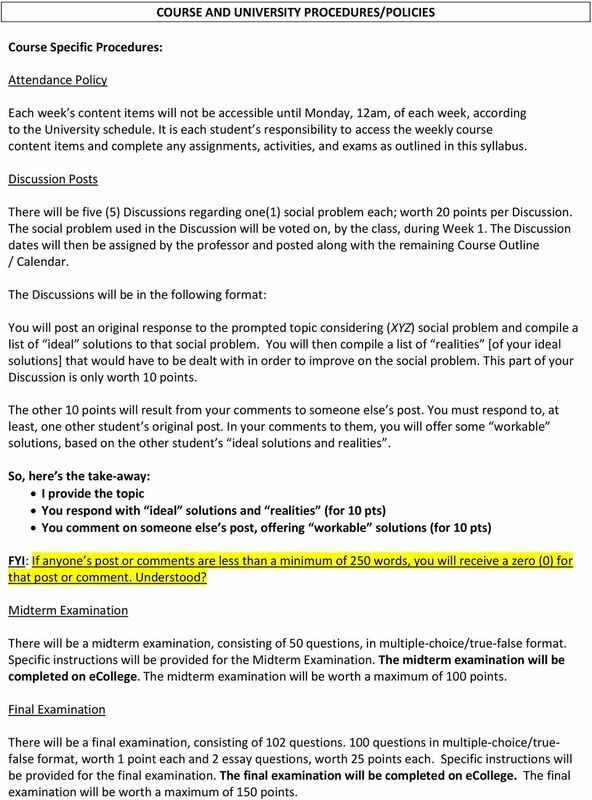 The social problem used in the Discussion will be voted on, by the class, during Week 1. 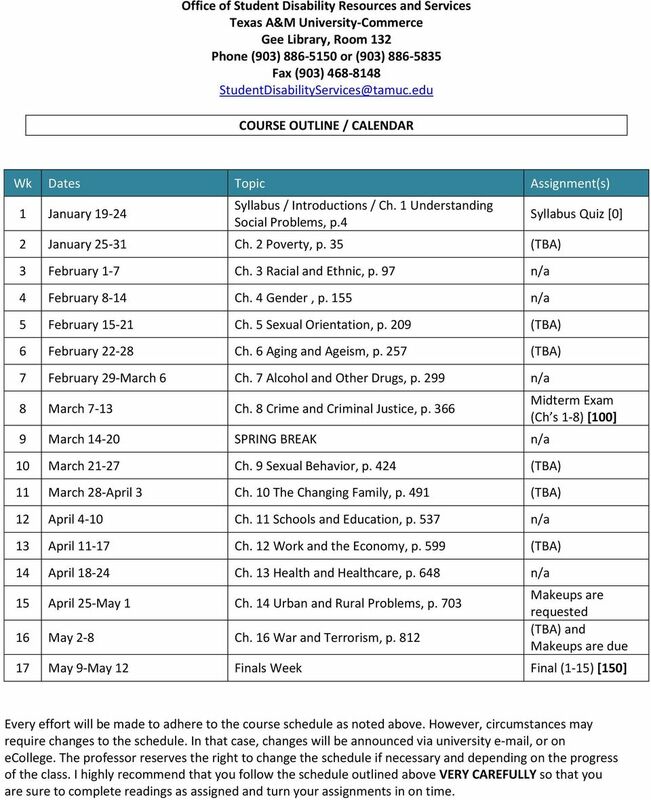 The Discussion dates will then be assigned by the professor and posted along with the remaining Course Outline / Calendar. The Discussions will be in the following format: You will post an original response to the prompted topic considering (XYZ) social problem and compile a list of ideal solutions to that social problem. You will then compile a list of realities [of your ideal solutions] that would have to be dealt with in order to improve on the social problem. This part of your Discussion is only worth 10 points. The other 10 points will result from your comments to someone else s post. You must respond to, at least, one other student s original post. In your comments to them, you will offer some workable solutions, based on the other student s ideal solutions and realities. So, here s the take-away: I provide the topic You respond with ideal solutions and realities (for 10 pts) You comment on someone else s post, offering workable solutions (for 10 pts) FYI: If anyone s post or comments are less than a minimum of 250 words, you will receive a zero (0) for that post or comment. Understood? Midterm Examination There will be a midterm examination, consisting of 50 questions, in multiple-choice/true-false format. Specific instructions will be provided for the Midterm Examination. The midterm examination will be completed on ecollege. The midterm examination will be worth a maximum of 100 points. Final Examination There will be a final examination, consisting of 102 questions. 100 questions in multiple-choice/truefalse format, worth 1 point each and 2 essay questions, worth 25 points each. Specific instructions will be provided for the final examination. The final examination will be completed on ecollege. The final examination will be worth a maximum of 150 points. 8 Office of Student Disability Resources and Services Texas A&M University-Commerce Gee Library, Room 132 Phone (903) or (903) Fax (903) COURSE OUTLINE / CALENDAR Wk Dates Topic Assignment(s) 1 January Syllabus / Introductions / Ch. 1 Understanding Social Problems, p.4 2 January Ch. 2 Poverty, p. 35 (TBA) 3 February 1-7 Ch. 3 Racial and Ethnic, p. 97 n/a 4 February 8-14 Ch. 4 Gender, p. 155 n/a 5 February Ch. 5 Sexual Orientation, p. 209 (TBA) 6 February Ch. 6 Aging and Ageism, p. 257 (TBA) 7 February 29-March 6 Ch. 7 Alcohol and Other Drugs, p. 299 n/a 8 March 7-13 Ch. 8 Crime and Criminal Justice, p March SPRING BREAK n/a 10 March Ch. 9 Sexual Behavior, p. 424 (TBA) 11 March 28-April 3 Ch. 10 The Changing Family, p. 491 (TBA) 12 April 4-10 Ch. 11 Schools and Education, p. 537 n/a 13 April Ch. 12 Work and the Economy, p. 599 (TBA) 14 April Ch. 13 Health and Healthcare, p. 648 n/a 15 April 25-May 1 Ch. 14 Urban and Rural Problems, p May 2-8 Ch. 16 War and Terrorism, p. 812 Syllabus Quiz  Midterm Exam (Ch s 1-8)  Makeups are requested (TBA) and Makeups are due 17 May 9-May 12 Finals Week Final (1-15)  Every effort will be made to adhere to the course schedule as noted above. However, circumstances may require changes to the schedule. In that case, changes will be announced via university , or on ecollege. The professor reserves the right to change the schedule if necessary and depending on the progress of the class. I highly recommend that you follow the schedule outlined above VERY CAREFULLY so that you are sure to complete readings as assigned and turn your assignments in on time. E-mail: amoore@unt.edu (Please don t e-mail me assignments, I will not grade them).